This movie has the pitch perfect precision and perfection like that of a Swiss watch. It is beautiful, moving, exciting and astonishing; no wonder that it ranks as one of the greatest films ever made. 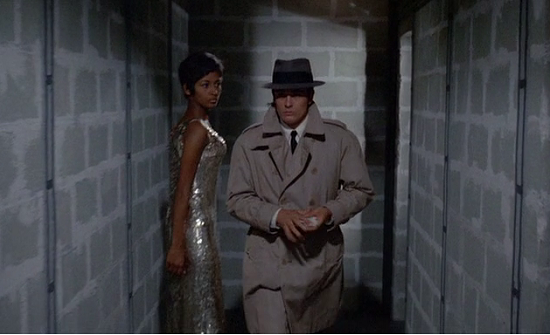 Jean-Pierre Melville's Le Samourai is the cinematic embodiment of ‘Cool’. 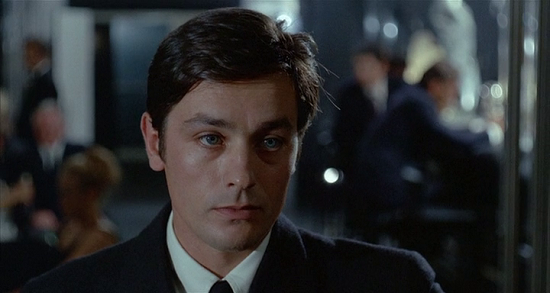 Jean-Pierre Melville took the idea of the lone gunman (perhaps more akin to the western genre than the crime genre), and created a film with the handsome star Alain Delon (his most outstanding performance) as an ultra-calm, smooth-operating contract killer Jeff Costello in Paris. The story plays out as Jef Costello completes a contract killing on a night-club operator, after setting up an almost too perfect alibi, but on his way out the door is seen by a the beautiful piano player. The police round up a number of people who look fit the description; Costello happens to be rounded up while at a card game. His alibi is strong, and mysteriously the piano player Valerie (Rosier) claims that this is definitely not the man she saw during a line-up organized by the police Inspector (Perier). Another man who watched Costello walk out of the club also says with certainty that this is not the man. Another club patron claims that he saw this man at the club at the time of the murder and claims this is the culprit. The remaining two witnesses aren't sure, but don't think this was the killer. We know its Costello, the third man believes it is him, but why do the two who had the best look claim that this is not the man they saw? The plot evolves from here. After an attempt on his life by his unknown employer, Jef gets paid for the job and he is given a new contract: to kill Valerie. After finding and killing his employer (Posier), Jef goes to the night-club to fulfill the contract on Valerie. Meanwhile, the police believe Costello lied during interrogation and follow him everywhere. 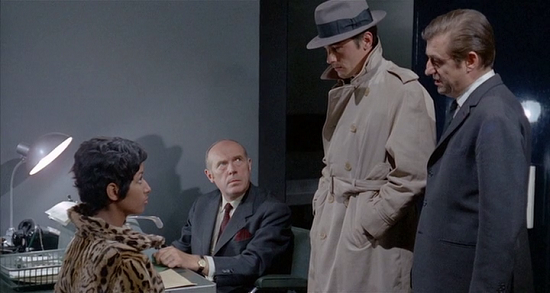 The result is a blend of stylistic and thematic excellence, a suspense film where Alain Delon as double crossed assassin stays one step ahead of the law headed by ‘Police Superintendant' (acted by Francois Perier) in what becomes a very smart cat and mouse plot. The sequence when Jef is tailed by cops is an attention grabber. Police are stationed on every platform, but Costello hops in and out of cars, switches platforms and trains, and toys with them. The film comes to end belying our usual expectations of an end and that then underscores the Samurai title. The film carries very little dialog with a couple of exceptions, which gives Melville a chance to perfect his storytelling technique. There's romance in that kind of passionless, self-sustained life, and one of the intrigues of “Le Samourai” is the way Melville draws us to Delon, provides almost no information about him and then alternately challenges and intensifies our attraction to him. Melville uses minimal plot to create some of the most hypnotic sequences ever achieved in the cinema. The long silences (as Delon escapes from the police tail in the Paris Metro or as he discovers that someone has intruded his private space because his caged bird seems to have disturbed) and the absorbing, almost musical rhythms of the protagonist’s and the camera’s movement together with the stylized use of color make this a piece of virtuoso cinema which is both intellectually and economically engulfing.